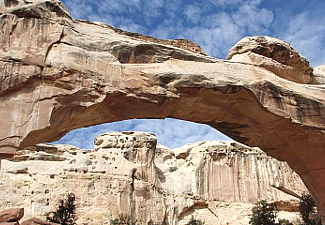 Hickman Bridge at Capitol Reef National Park. 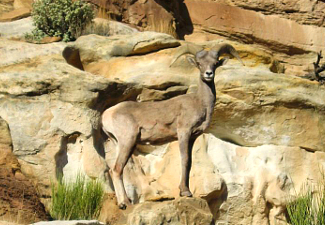 Image courtesy National Park Service. Summer - Area has an arid climate with little rainfall, on average under 8" per year. Temperatures are hot in summer months with aveage temperatures in the upper 80s to low 90s. Winter - Average high temperature in December and January is in the lower 40s with 2" to 5" of snow on average per month. As in any location, please check the local weather forecast before you go, bring plenty of water and other supplies, and pay attention to your surroundings. 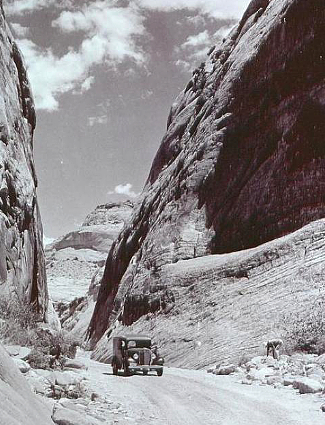 Photo above: Car driving through Capitol Gorge in the 1930s at Capitol Reef National Park. 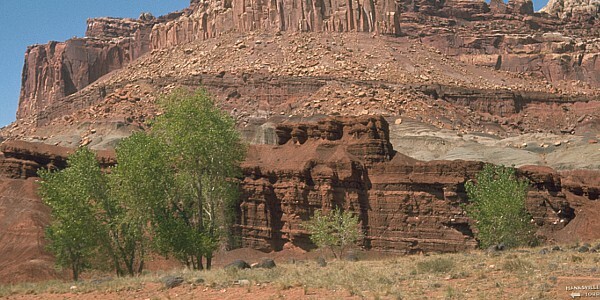 Right: View of the mountain known as the Castle at Capitol Reef National Park. Photo Source: National Park Service. Sure, it's only been a national park since 1971, but the unique spires and rocks of Capitol Reef have been protected since August 2, 1937 when President Roosevelt designated it a National Monument, although public access really didn't begin until 1950. For sixty miles from north to south, this unique landscape will marvel you with rocks from a fast food joint (yes, Hamburger Rocks), bridges that were not made by man-made engineering, and gorges that rise above you like monoliths from a distant past so large, it feels like you're being engulfed by earth. Capitol Reef is a must see for those who are trekking through the wonderful Utah parks, and while it certainly is not a secret with nearly one million visitors, you probably would be hard pressed to get one percent of the population east of the Mississippi to name it or its location. Guess that doesn't really matter. The other named capitol in the east, where many guesses would go, has problems of its own and less natural wonders. The Gifford Homestead. Restored farmstead of a Mormon family settlement. Known as the Gifford Homestead, the original home was actualy built by the Pendleton family in 1908, who they lived their for eight years. The Jorgenson family followed for eight years as well, before selling to the Gifford's in 1928. They would live and work the farm for forty-one years, selling to the National Park Service in 1969, and were the last residents of Fruita. The farm is located one mile from the visitor center, has a store, and picnic area. The Gifford farmstead was only one of a number of homesteads in the Fruita area staked by Mormon families in the last half of the 1870s. The town was originally known as Junction, but due to its proximity to the Fremont River and growth in orchards that came due to the plentiful water, was renamed in Fruita in 1902. 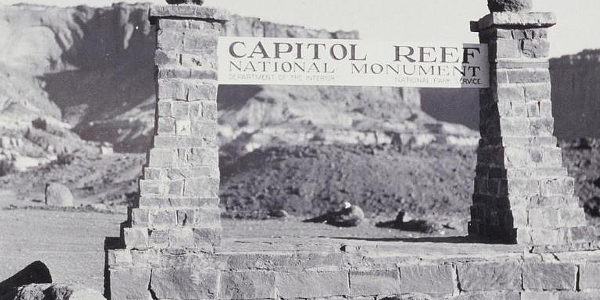 Photo above: Entrance sign at Capitol Reef, 1937. Photo courtesy National Park Service. Below: One of the many scenes at Capitol Reef National Park. Photo courtesy National Park Service. Today, the orchards remain with three thousand trees maintained by the National Park Service. Visitor are able to pick and consume the fruit for free during picking season. A fee is charged if you take some out. Today, most of the community buildings are gone, except for the Gifford House and the restored Fruita Schoolhouse. For the majority of the rest of Capitol Reef, the sights and wonder come from natural scenes, gorges, rocks, as well as the Indian heritage of long before the Giffords. There's so much to see in this park of distinct features, both natural and settler oriented, that keeping your focus might get hard. First stop at the Fruita area Visitor Center for the film, ranger tours during the high season, and orientation. Orientation, if you wish to wander outside the Fruita district, is important. Take advantage of the rangers experience. 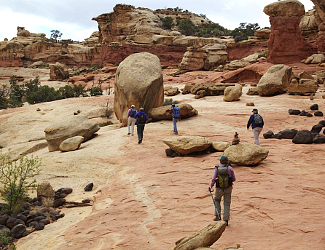 While most first-time visitors to Capitol Reef will focus on the amazing sights of the Fruita section, some of its most amazing features are far-reaching hikes into the backcountry off dirt roads that might require a jeep or suv. But if you only have a day to explore, don't fret. What can be seen along the Fruita Scenic Drive is spectacular as well. From the historic Fruita District of man settling the area to the Hickman Bridge that only nature could create, Fremont petroglyph panels noting the Indian heritage, the Capitol Gorge, and the Gifford House, you'll have plenty to be amazed at. Capitol Reef National Park T-Shirts and Souvenirs from the official merchandise of America's Best History. 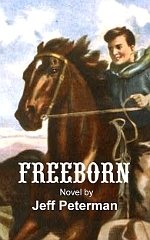 Great for your next western vacation or planning session. 1. Stop at the Fruita Visitor Center and watch the orientation film, then head out on the scenic drive tour. There are eleven stops on that tour and some require hikes to see all of the sites. Hike to your capabilities and remember to take enough water and supplies to hike safe. Take a gander, if you can, at the Wingate Sandstone. Odd, but breathtaking. 2. Take in one of the guided ranger tours during the spring to fall season. There are regular programs on Geology, Fremont Culture, and an amphitheatre evening talk on weekends. Special walks abound as well, including those that require two to three hour hikes, or for those with less time, talks at the Fruita Schoolhouse. 3. Hike to the Hamburger Rocks, if you have the inclination and ability. Located in the southern Waterpocket District, it's a nine mile roundtrip hike and may require a four wheel drive vehicle to get to the starting point. You can take the twelve mile route, which is part of the 15 mile Lower Muley Twist backpacking route. That's longer, but easier per access, descent, and climb. Ask at the Visitor Center for current conditions and directions. Photo above: Hikers among the Black Boulders. Courtesy National Park Service. Fruita District - Central section and main area of the park off Route 24. The Visitor Center, Gifford House and Museum, the Fruita Schoolhouse, and the Fruita campground are located here as well as the Capitol Reef Scenic Drive. Many trails from easy to strenuous stretch from the drive, as well as other roadways that require a high clearance vehicle. Waterpocket District - Southern section of the park. Roadways are predominantly unpaved, but some can be accessed with regular passenger cars, depending on the weather and season. Spectacular scenery and 124 mile Loop-the-Fold driving tour. Cedar Mesa Campground is also located in this area and so are those Hamburger Rocks, but they take a nine or twelve mile roundtrip hike to see. Cathedral Valley - North section of the park that may require a high clearance vehicle, depending on weather and season. Spectacular views, Cathedral Valley campground, and the Cathedral Valley Loop Driving Tour of fifty-eight miles. 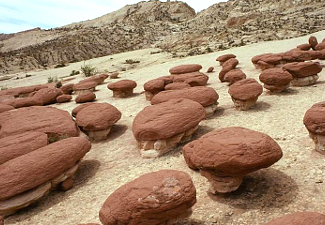 Photo above: Hamburger Rocks at Capitol Reef National Park. Photo courtesy National Park Service. 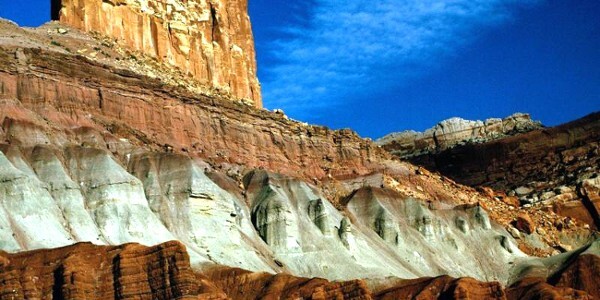 Capitol Reef National Park is located in the south-central part of Utah. From I-70 west, take Exit 149, Route UT-24 west for 80 miles. From I-70 east, take Exit 40, right on UT-120 for 1.2 miles, left on UT-118 for .8 miles, right on UT-119 for 8.8 miles, right on UT-24 for 63 miles. For those traveling on I-15, it's even more confusing. Might be best to check your GPS or favorite map program. From UT-24, you'll be entering the central part of the park, heading toward Fruita. This is the main part of the park most people visit. There is no restaurant or lodge within Capitol Reef National Park. Some food can be bought at the Gifford House Store and Museum during the summer season when open. 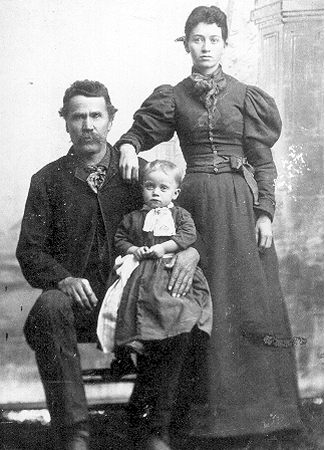 Photo above: Nels Johnson family, one of the first settlers in the Fruita area in 1880. Courtesy National Park Service. There is one developed campsite south of the Visitor Center in the Fruita Historic District. It has 71 sites and is located in an orchard near the Fremont River. This location fills up fast during the high season. There is an amphitheatre here with ranger programs. Two back country campgrounds exist. 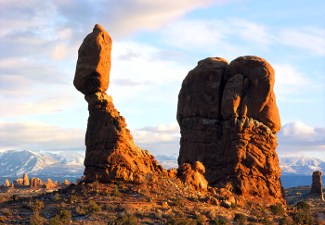 Cathedral Valley, 7,000 feet elevation, has only six sites, thirty-six miles from the Visitor Center. Cedar Mesa, 5,500 feet elevation, has five sites, and is located twenty-three miles south of Route 24. Backcountry camping, no vehicles, is allowed with a free permit. Outside the park, camping is more plentiful within the Dixie and Fishlake National Forests, and at other private campgrounds. For those more into the motels and bed and breakfasts route after your hike or visit, check out your favorite online lodging site such as Expedia for the lodging type of your choice. Photo above: Wildlife watching the visitors at Capitol Reef National Park. Courtesy National Park Service.